Pictured at the New Saints club in St Neots is the successful Peterborough Police team of (from the left) Chris Baker, Imraan Shirazi, Akif Shirazi, Mark Dane and Kacper Kozak. There was a winning double for Peterborough Police Amateur Boxing Club when two of their fighters boxed at a show in St Neots at the weekend. Imraan Shirazi (11) got their first victory when unanimously outpointing B. Stanley from the hosting New Saints club. 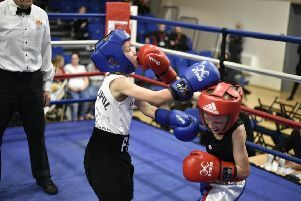 The Bretton youngster dominated all three rounds connecting throughout with a vast array of combinations. Kacper Kozak (15) from Orton made it two wins out of two for the city club when stopping G. Macey from New Saints in two rounds. Kozak hooked well to the body and landed some heavy shots to the head for two rounds before his opponent retired at the end of the second round. Ben Hutson (12) from Glinton did well in a skills bout against Walter Smith from New Saints to show he’s almost ready to make his competitive debut. Paston pair Aiden Smith (16) and TJ Harty (17) were both winners for the Kettering School of Boxing when appearing on their weekend show. Smith beat Telford’s Liam Marsden unanimously on points while Harty stopped Taylor Barbour from Bude in two rounds.